Being the jolly curmudgeon that I am, the Christmas season—for me, at least—shouldn't start until (a) it's December, and (b) we've seen snow at least once. There is to be no dancing or prancing in Jingle Bell Square until the air is sufficiently frosty. Figgy pudding is out of the question so long as there's still leftover turkey and stuffing in the fridge. And if I see someone hauling out the holly before Thanksgiving, it makes me want to haul out the shotgun and take aim at their festive inflatable reindeer. "Humbug," I say. And also, "bah." Then my wife came home with eggnog as it snowed on Halloween. Technically, the eggnog came a little sooner, and the snow a little later, but the point is that someone decided that the official beverage of the holiday season (along with snow!) should be available in October. 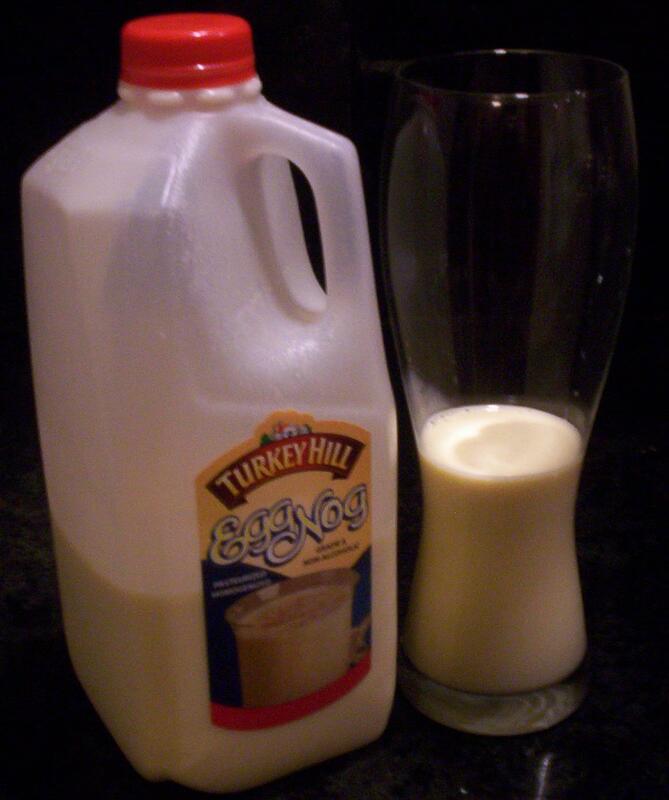 And my wife, who likes eggnog more than she likes my perfectly reasonable decree that the most wonderful time of the year only lasts 2-3 weeks in December, has kept our home stocked with the hit-or-miss libation ever since. Don't let the generic name fool you—take a chance on the ridiculous holiday cow. 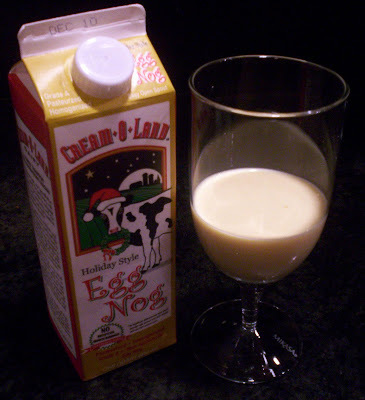 Striking a satisfyingly sweet balance between eggy and creamy, this is the drink to which other eggnogs should aspire. There's nothing particularly notable about this one, other than that it's good, plain and simple. It doesn't go overboard with its flavor and consistency; by being relatively average, it ends up being above average, if that makes any sense. And if it doesn't make sense, read on, and you'll find how individuality is not necessarily a trait to be coveted in eggnogs. Verdict: 4/5: Easily drinkable, filling but not heavy, and flat-out tasty. It's...eggnog. 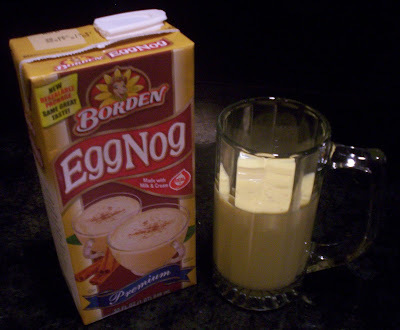 Pretty much what I think of when I think eggnog. Coats your throat without being overly thick; more eggy than creamy; has that faint smell of "holiday spices," whatever those are. Verdict: 3/5: It's fine. It's eggnog. Wait...Borden!? The cheese people?? And it comes in an unrefrigerated box?? There was no way this would be any good. And it wasn't. It was tolerable at first; nothing more or less than creamy egg glop. No "holiday spices" to speak of. And yes, I did refrigerate it first. 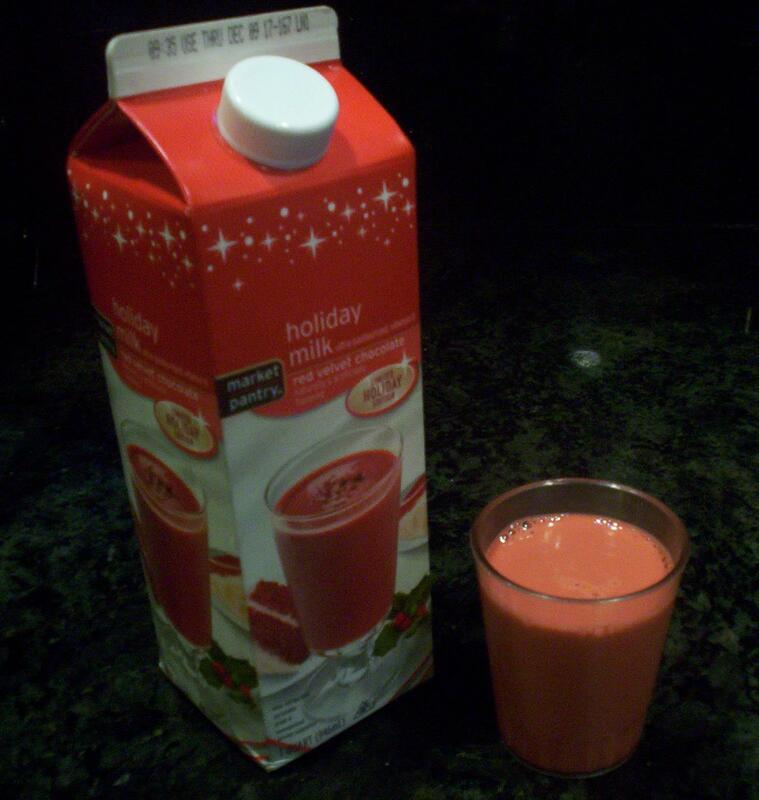 After a few sips, that "processed, out-of-a-box" smell quickly gave way to something more foul, like the eggnog had started to spoil in the ninety seconds it had been in my glass. The texture is what finally got to me—this eggnog is nearly gag-inducingly thick to begin with, but as it coated my throat more and more, it reached a point where it felt like drinking egg-flavored plastic cheese. You know what I mean by "plastic cheese," right? Processed cheese singles...like the kind Borden makes. Verdict: 0/5: I got through half of the half-glass I'd poured myself before giving up, and I still feel a little sick. My wife says this one tastes nothing like caramel and everything like melted whipped cream, which is a total fib—the caramel taste here is almost brutish at first. You can smell it: it's like slightly burnt caramel. As far as consistency goes, the melted whipped cream comparison isn't too far off, and I suppose it does taste a bit like whipped cream...buried under layers of caramel that do seem to mellow the more you consume. Whatever it tastes like, it certainly isn't traditional eggnog—though that's not necessarily a bad thing. Verdict: 3/5: It's pleasant enough. I don't mind caramel, but it's never been a selling point for me, so this is probably the highest score a 'nog like this could get. This one was simply too ridiculous to pass up. 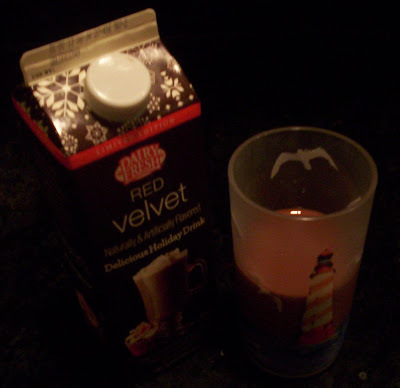 Red Chocolate Velvet Holiday Milk?? Preposterous. It was like drinking chocolate pudding with the consistency of Hershey's Milkshake—the latter being my all-time favorite premixed chocolate beverage out of a can, bottle, or carton (at least, until they seemingly changed the recipe a few years ago). This was rich, creamy, chocolatey, velvety, and satisfyingly desserty. 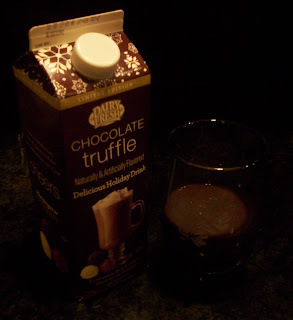 Easily a contender for best premixed chocolate beverage I've had. Verdict: 5/5: If "easily a contender for best premixed chocolate beverage I've had" isn't an endorsement, I don't know what is. Look at that carton design. My wife says you can't go wrong with the holiday cow, and I'd say that's true. Though I'm a little suspicious of the "Holiday Style" descriptor; it's sort of like saying "Holiday Style Christmas Carols" or "Lawyer Style Subpoenas." 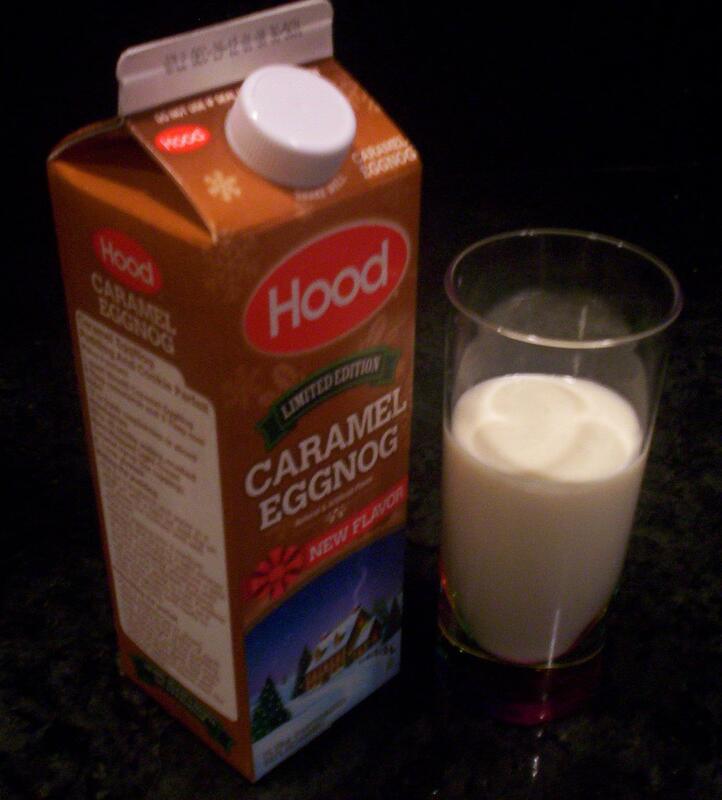 If you were to take Hood Caramel Eggnog and remove the caramel flavor, this is pretty much what you'd get. Impressively smooth, pleasantly creamy, and not all that eggy. Not unlike drinking melted eggnog-flavored whipped cream. Verdict: 3/5: Enjoyable, but perhaps too light for its own good; feels like there's something missing. Perhaps that caramel eggnog left more of an impression than I thought. I see you, impostor holiday cow. You think you're all festive, but in fact, you are not. Do I see a Santa hat? Do I see a wreath in your mouth? No. Where is your holiday style, cow? I tried valiantly to peg the unusual aroma wafting up from this 'nog, and the closest I could get was "faintly egg-scented garbage masked by cleaning solution" before my wife suggested it smelled like alcohol. Amaretto, Kahlúa, or Bailey's, to be specific. Clearly, I have no idea what I'm talking about. This 'nog is reasonably thick, and the taste is on the eggier side, to be sure, but still creamy. My wife says it gives the impression of being spiked, without actually being spiked. My wife also says she should write her own reviews of these eggnogs. 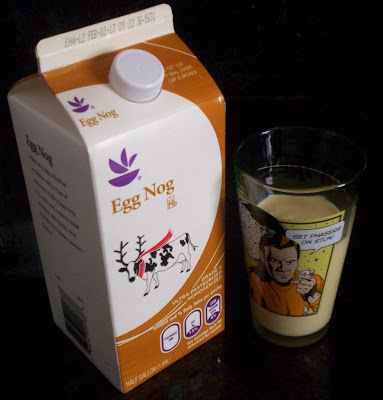 Verdict: 2/5: This eggnog confuses me. You'll probably like it more if you like the taste of...what did my wife call it, "alcohol"?...but I can do without that. Chocolate truffle, eh? Well, Dairy Fresh does not disappoint. Another viscous delight in the same puddingy vein as Market Pantry's Red Velvet Holiday Milk, though the first sip or two reminded me of regular chocolate milk—at least, the way I make regular chocolate milk, which is chocolate syrup and possibly a splash of milk. This really does taste and feel like a melted chocolate truffle. Verdict: 4/5: Not quite decadent, per se, but certainly more of a dessert than a beverage proper. And a very tasty dessert at that. Finally. 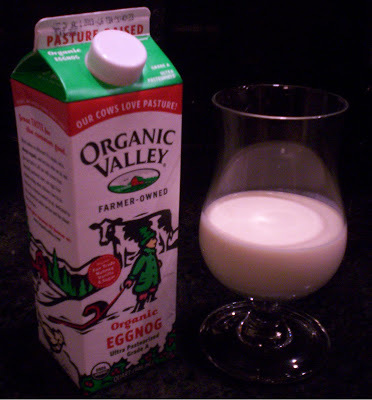 While Tuscan Holiday Eggnog is what I expect when I have eggnog, Redundant Valley Eggnog is what I hope for when I have eggnog. It's like drinking milk, but thicker, and more on the vanilla ice cream side of dairy flavors. The ingredients list suggests that "organic fair trade nutmeg" is the source of the hint those elusive holiday spices here. Verdict: 4/5: Delightful. I don't know whether the "organic" bit is what makes the difference, but I certainly wouldn't mind more eggnogs like this. 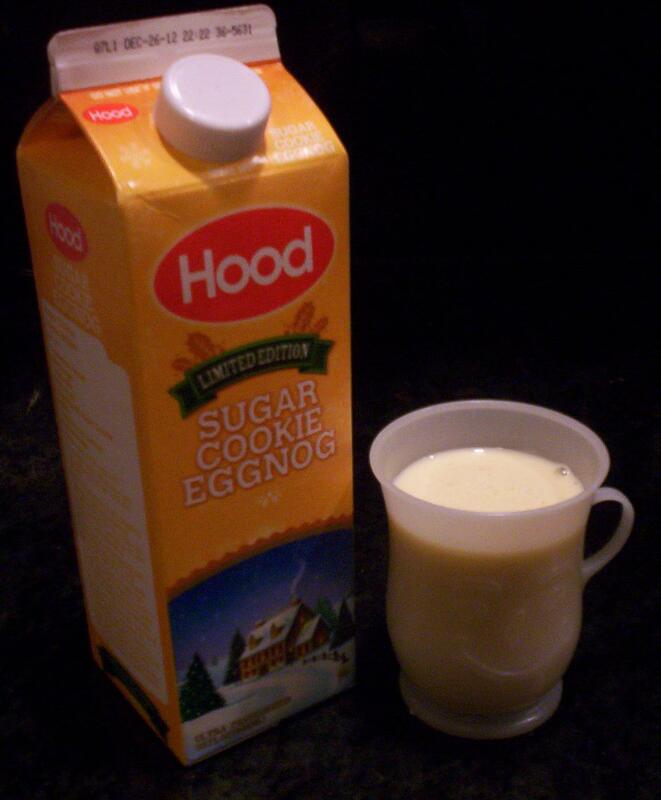 So far, I am very impressed with Hood's ability to accurately convey what their eggnogs taste like. (Or, conversely, succeed at making their eggnogs taste like what they want to name them.) This one is nothing short of liquid sugar cookie. I'm beginning to think that "eggnog" is just a code word for specialty beverages that would otherwise be too novel for most people to take a chance on. Verdict: 5/5: It's just as desserty as the Dairy Fresh Chocolate Truffle, but not so thick and rich that it strays from being a traditional beverage. Addictive. Is there actually a market for more than one brand of red velvet holiday beverage? Perhaps...but as far as I'm concerned, not while Market Pantry is still in business. This one actually tastes like red velvet cake, which puts it at a disadvantage—I'll eat red velvet cake, but I'm not a fan. Excessive frosting usually ruins a cake for me, and red velvet anything (at least in my experience) is characterized by excessive frosting—even when it's poured into a cup. There's enough of that essence of red velvet (both in smell and taste) to give the impression of the cake portion of this equation, but it's that too-sweet frosting flavor that wants to run the show here. Verdict: 2/5: If you're a fan of red velvet, bump that score up a point. For me, it's too much like the frosting and not enough like the cake. It's...eggnog. Think Tuscan Holiday Eggnog, but switch out the "holiday spices" for a stronger scent of egg. Verdict: 2/5: This one's pretty average as far as eggnogs go, but the smell matters a great deal now that I'm an eggnog snob. 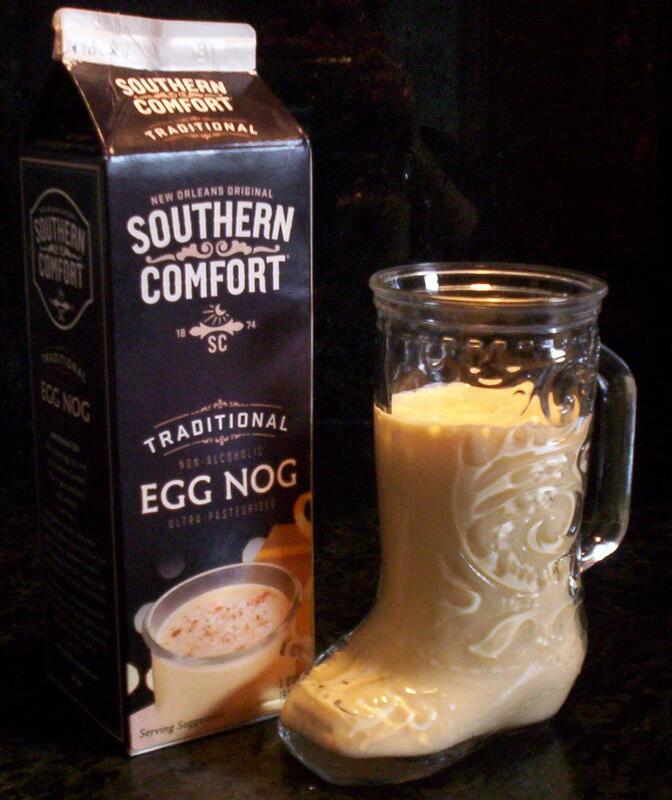 Well, it's about time that someone 'fesses up that there is, in fact, no egg in their eggnog. So, it's just called nog. The Ferengi would be proud. I would be proud, too, except (a) I can't deal with the ridiculously long and silly name, and (b) it's not very good! 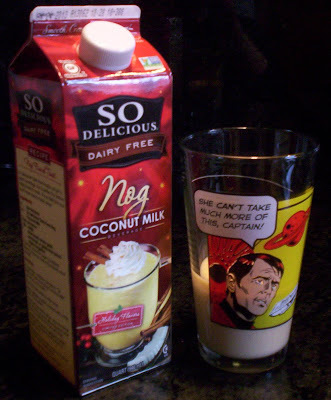 I am perhaps not the right audience for this drink, because I like my dairy, and I've always found coconut milk to be a little too strong for my tastes. The texture and flavor are that of a milkshake made of coconut pudding and coconut milk that's somehow non-dairy. Verdict: 1/5: If you're lactose-intolerant or cuckoo for coconuts, give this an extra point or two; I, for one, could not stop making faces while drinking this. I think using the Scotty glass was appropriate for this one. If you would've asked me last year which brand of eggnog was the best, I would've told you without hesitation that it was Southern Comfort. 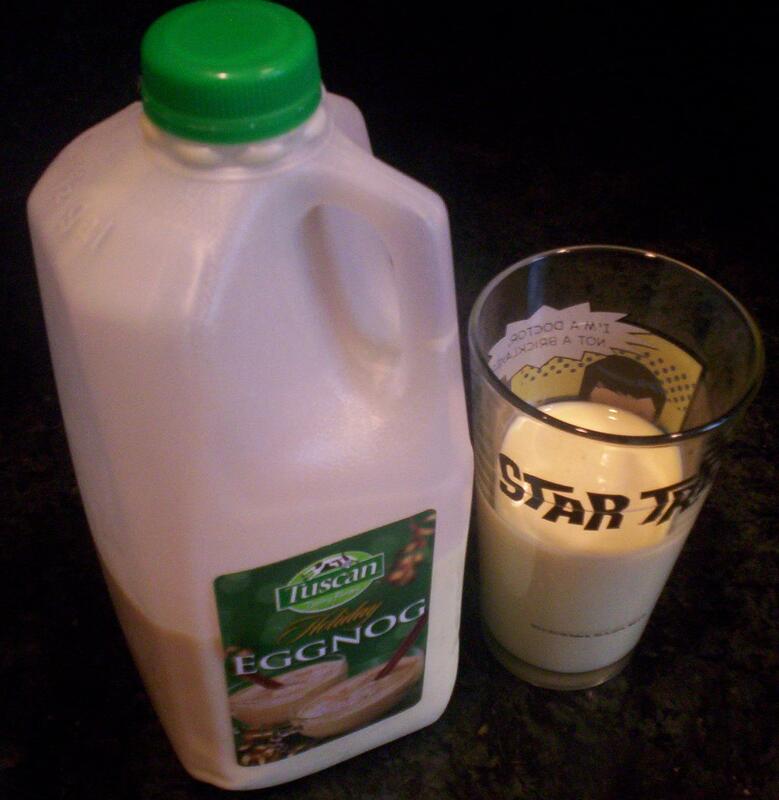 After consuming more eggnog in the past few months that I've consumed in the last decade, I'm not so sure anymore. This is a proper eggnog—thick, balanced evenly between creamy and eggy, gently wafting "holiday spices" into the nostrils as the glass is drawn near to the nose (or mouth, or however you drink your eggnog)—but after my experiences this season, I've concluded that I'd rather have an improper eggnog that makes little or no attempt to live up to the "egg" part of its namesake. Don't get me wrong—Southern Comfort is good, and it's still one of the best eggnogs around. I suspect that I'm simply suffering from overexposure, and it doesn't help that I had this directly after a glass of the So Not Delicious Absurdly Convoluted Title Coconut Milk Drink Beverage Nog. 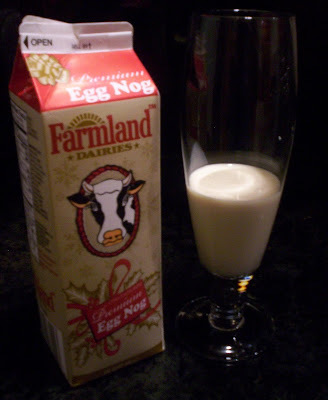 Verdict: 4/5: A hearty, quality eggnog. Be sure to keep an eye out for the vanilla-flavored variant; I couldn't find it this year, but that extra touch of creamy sweetness makes this eggnog even better. Folks, I am officially eggnogged out...and I haven't even scratched the surface of what's out there. Hood alone has a few more special flavors to try, and that's to say nothing of all the regional brands and offerings from local dairy farms. We'd love to hear from you if you've got a different opinion on these drinks, some recommendations of your own, or some horror stories about eggnogs and "holiday milks" to avoid. Merry Christmas, happy holidays, and happy...erm...eggnog consumption. It was the best of games; it was the worst of games…and all one Game Boy Color cartridge! Dragon Warrior (aka Dragon Quest) was published in the same era as Final Fantasy by the Enix part of the now-juggernaut Square Enix, or “Squeenix” as lovingly called by us professionals. Also similar to Final Fantasy, it spawned a gaggle of sequels and offshoots. Finally, like all good fantasies, it only made sense to update the graphics, tweak the balance, update the King James script, and re-release the game for a modern console. Well, modern at the time. I named my character Biff (given the four character limitation of the Game Boy version) and quickly learned he was a descendent of Loto (known as Erdrick in the North American NES port). 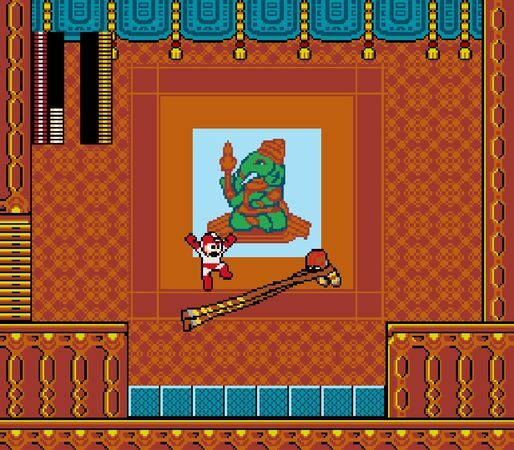 Apparently some evil genius DracoLord (Dragonlord on the NES) had stolen a magic tchotchke and was using it to ruin everything for everybody. Of course, it fell to me to save the world; this wasn’t The Sims where I could expect to beat the game by calling friends and selling used cars. Well, all the fixtures of the classic RPG are present as you enter this land. You get to wander a glorious 8-bit world slaughtering slimes, leveling up, collecting gold, buying bling, and staying at inns while progressing towards your destiny: defeating DracoLord! The only surprise for modern gamers? You are on your own. This game is a party of one. However, it’s this honest simplicity that appealed to me most. The updates to the game make it a touch easier and faster than its older NES counterpart. Plus, NPCs you encounter share useful clues with you. No one blathers on about the weather or a pie they baked, save the “puff puff massage” girl at the bathhouse. You should get to know her. Moving on! 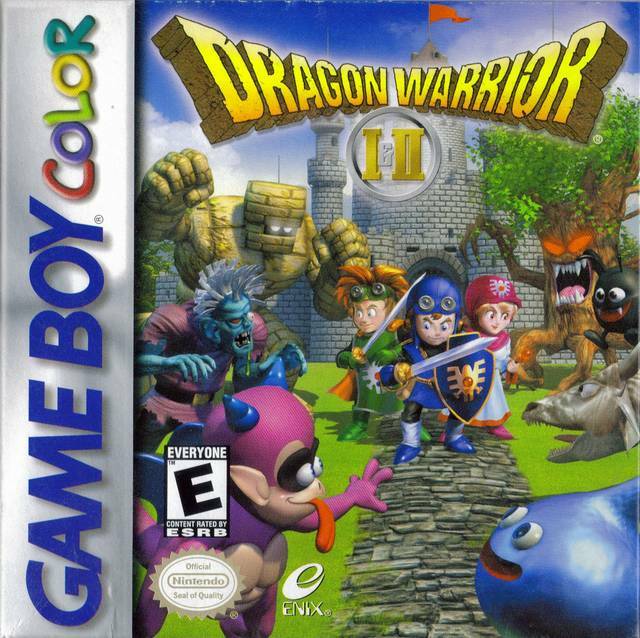 To a seasoned veteran of RPGs, Dragon Warrior is a great weekend project. You’ll be humming the chiptunes long after your adventure is over. In this adventure, you play as the descendent of the warrior in your first game. So, I named him Baff. From the introduction, you learn you will not be alone this time. Your first objective is to assemble your team. If you are able to complete this objective, you may have a chance at beating the game. I’m serious. I believe it took me as long to track down the first of my peeps as it did for me to beat the first game. Not that there were too many places to look, mind you; that would have been far less frustrating. No, I was visiting the same places over and over. Having become so over-leveled, I even wound up going to a cave some old man told me I dare not visit alone, wondering if perhaps he was evil and lying to me. Fortunately, our third teammate revealed herself much sooner, and we were on our way. With your team assembled, you embark upon a mighty fetch quest. Unlike the last game, where the McGuffins you collect along the way are either useful or novel, in this game, little of what you collect does more than allow you to collect something else. There are a few neat locations you visit along the way, but the game by and large lacks the charm of the first. To its credit, though, many of these drawbacks are symptoms of evolutionary growing pains. 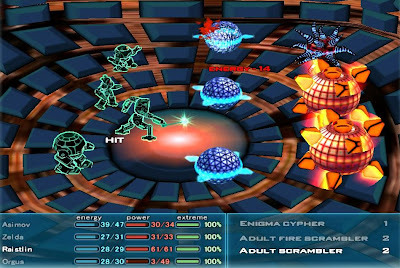 Having additional party members facing more than one creature at a time adds new dimensions of strategy to the battles that weren’t present in the first game. The introduction of new ways to travel opens up the world, making the game feel less linear. You even get to visit locations and pick up items from the last game, strengthening the story continuity and making this journey feel like a part of something bigger. All those changes almost made up for the negatives. That is, until I arrived in the final area and unlocked hard mode. After hours of searching, finding, unlocking, revisiting, band camp, grinding, grinding, and grinding, I felt prepared. Unlike the first game, I had managed a deathless run to this point. I set foot out into this new land and was crushed like an ant on a kindergarten playground. It happened over and over and over again. I was dumbfounded. After spending as much time grinding in this place as I did to reach it, I was finally ready to defeat the evil dastard who thrust this torturous quest upon me. Watching him disappear into oblivion? Priceless. Still, despite returning peace to the kingdom once more, my dragon sense tingles. I feel, perhaps, evil has yet to be permanently vanquished. When asked why, I can point to only one sign: the Dragon Warrior III cartridge on my shelf. To celebrate Mega Man's 25th anniversary in style, I got together with my longtime friend (codename Dash Jump) and my wife (alias Z-Saber) to stream over 20 continuous hours of Mega Man over the Internet, with viewers from all around the world tuning in at various times to join in the fun. What began as a televised second helping of my 2010 Mega Man marathon soon became a more massive undertaking and learning experience than I had ever expected. Our marathon comprised Rockman 1-6 for the Famicom (both because we'd never played the original Japanese versions of the NES games, and because the Famicom A/V was easier to stream from), Mega Man 7 for the SNES, Mega Man 8 for the PS1, and Mega Man 9-10 for the Wii. If you missed any part of the marathon, or if you'd like to relive the memories, pay a visit to any of the links below—the whole thing is saved there for future generations to look at it and say, "What were you guys thinking!?" I'm giving Dash all the credit here [Dash's note: I accept all the credit! ]—I might've come up with the idea, but he's the one who provided the hardware and expertise that allowed us to stream ten different games on four different consoles from the comfort of my living room. Not only that, but he did an excellent job of moderating the viewer chat room—something I mostly gave up on after I started getting a headache from looking back and forth between the gameplay on my television and the text scrolling by on his laptop. I mentioned this was both a learning experience and a more massive undertaking than anticipated; perhaps the best way to illustrate what I mean is with a few lists. - Breaks! When one of us needed to eat or step out of the room for whatever reason, the other could keep playing to cover for us, so there was seldom a break in the action. This also helped limit the amount of down time between games; aside from swapping out cartridges and systems, we rarely needed more than a minute or two until we were ready to roll again. - Commentary! We were, at various times, thoughtful, insightful, clever, funny, and generally entertaining. Even as the marathon dragged on and we slogged through the games and stages we weren't as fond of, we often managed to stay chatty and keep a positive attitude (or at least sound like we had a positive attitude). - Responsiveness! Between the three of us, someone was always monitoring the chat room, and we tended to be very good about responding to the questions and requests of our viewers. - Participation! All three of us were frequently and meaningfully involved in various aspects of the marathon. - Completion! We actually beat all ten games. How 'bout that. - Starting! We told everyone we'd begin around 8:00 AM; we started closer to 8:20 AM. That's not too far off when you're talking about an all-day marathon, but we probably could have put up the "preloader" screen in time for the people who showed up early to be reassured that this was still happening. - Expectations and timing! My previous marathon—which was interrupted for 45 minutes by an unexpected errand, had a few longer breaks, and involved me collecting basically all the optional bolts in Mega Man 8—clocked in at about 16 hours. Even allowing 17 hours for this marathon would surely be more than sufficient, bringing the event to a close by around 1:00 AM at the latest. That's late, to be sure, but not an hour at which either of us is unaccustomed to being functional. We ended at 4:00 AM. Our breaks between games were almost nonexistent, we skipped half the bolts in Mega Man 8, and we finished three hours later than the latest I was prepared for. Our original plan was to have me be the primary player for all ten games, with Dash occasionally jumping in on the games he was more experienced with. While classic Mega Man and platformers in general are my specialty (and the ten games we marathoned were still fresh in my mind from my YouTube videos and my 2010 marathon), Dash is better at the Mega Man X series and other genres of games. [Dash's note: True dat.] I think we both recognized that, while it might be more fun to share the marathon equally, things would probably flow better if I covered for Dash on the games he'd only played once, or too long ago to remember well. Neither of us discussed changing the plan. When I kept offering him the controller after beating a stage, and he kept accepting, the marathon transformed from a relaxed speedrun of Mega Man 1-10 into a casual "Let's Play" of Mega Man 1-10 with no definite endpoint. The whole point was to have fun playing these games together, but I was so focused on how far behind schedule we were that I could barely let either of us enjoy the marathon fully. It wasn't long before I started hammering Dash with unwelcome, unsolicited advice [Dash's note: And don't forget the rolled-up newspaper!] about how to get through each stage more quickly, and even my theater background couldn't mask my unhappiness with fighting Clown Man after my bedtime. - Understand the person or people with whom you're collaborating, and be attentive to their mood, playing style, and gaming ability. Create a plan, agree on the plan, stick to the plan. Clearly communicate your expectations to each other, and clearly express when things aren't meeting your expectations or going as planned. [Dash's note: Is this marriage advice?] I could go into more detail here, but suffice it to say that almost everything that could've gone better with the marathon was the result of us doing the opposite of everything mentioned above. - For future marathons, Mega Man & Bass should be played in place of Mega Man 8. Unrelenting difficulty be darned! Anything's gotta be better than...well, pretty much everything about that game. - Unless it's an intentionally blind playthrough or a spontaneous decision to play a particular game, spend a little time before the marathon/livestream practicing or reading up on the game(s) you're going to play. 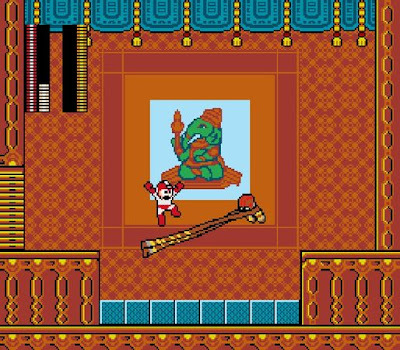 This is especially important if there are known trouble spots—dodging the shots of Mega Man 7's final boss, for example, or the labyrinth sections of Astro Man's stage in Mega Man 8. - I am not cut out for livestreaming on my own; this would have been a complete disaster without Dash. [Dash's note: Most things are a complete disaster without Dash.] Simultaneously monitoring the chat room, providing commentary, actually playing a game, periodically advertising my various social media accounts, and ensuring the technology still works is not something I can see myself happily or competently doing. - Never forget how awesome your viewers are. A handful of people spent the entire 20 hours with us. Some of our viewers went to bed, and came back seven or eight hours later to see if we were still playing. We had people digging up articles, video links, and even creating custom images for us on the fly. It didn't matter that we scored dozens of Game Overs or accidentally had to replay half of the castle stages in Mega Man 9; our viewers were there for us, and that's a magnificent feeling. 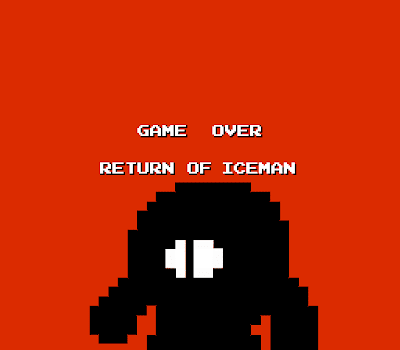 Overall, despite the fatigue, failure, and frustration I know we both suffered at certain points (GAME OVER RETURN OF ICE MAN), I'd say the Megathon (as Dash likes to call it) was a great success. We provided the Internet with 20 more hours of entertainment, Dash's livestreaming career is off to a strong start [Dash's note: Thanks, Gemini!!! 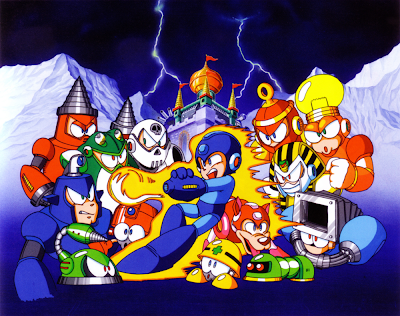 ], we both gained more subscribers and followers, and we got to celebrate Mega Man's 25th anniversary in style, among friends both near and far. Livestreaming Mega Man Marathon Is a GO!!! The livestreaming Mega Man 25th Anniversary Marathon is ON!!! The all-day gaming madness will start at (or a little after) 5 AM Pacific / 8 AM Eastern / 1 PM UK on Monday, December 17. I (AKA Flashman85, AKA GeminiLaser) will be playing through Mega Man 1-10 with DashJump, and my wife (codename Z-Saber) may be flitting in and out. By the time we're done, we'll have no idea what our real names are anymore. If you miss any part of the marathon, fear not! I'll follow up in a day or so with a link to where you can watch the whole thing, recorded, at your leisure. Hope you can join us! If all goes well, Monday will be filled with 15+ hours of Mega Man. If all does not go well, I still hope to use the channel for at least a few less-ambitious projects, such as a blind playthrough of Street Fighter X Mega Man, a marathon of the Game Boy Mega Man games (which, for a few reasons, would be much simpler than a marathon of the console games), and probably even something that isn't Mega Man, if you can believe that. I'll be sure to post updates here on Exfanding when I'm planning something in advance, but you may wish to tune into my GeminiLaser Facebook page, our Exfanding Facebook page, my YouTube channel, or our Twitter...thingy. Whatever it is you call a channel for people on Twitter. Probably safe to say you won't hear about it on Twitter. I realize we're already halfway through December and I've only written three posts for the month. (Well, four, now that this one is here). What's been going on, you may wonder? 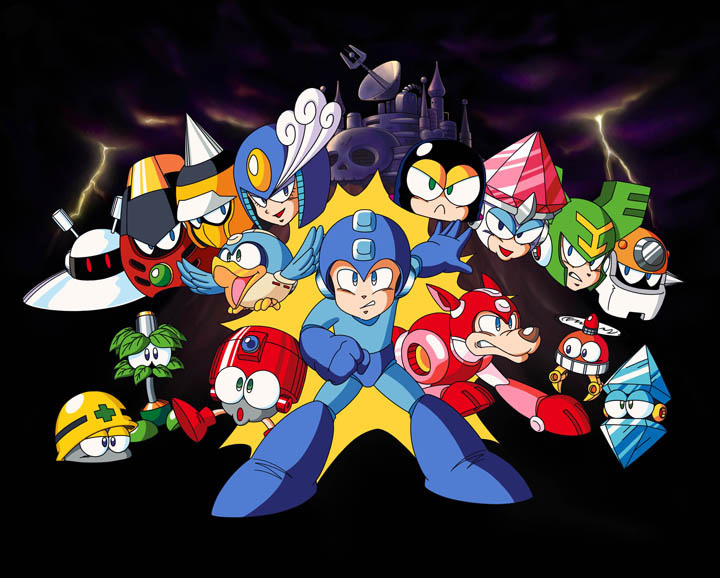 - I am excitedly gearing up for an all-day Mega Man marathon on Monday, December 17 to celebrate the 25th anniversary of my favorite video game franchise. Similar to my 2010 marathon, I'll be playing through Mega Man 1-10, though if I'm making good time I may toss in Mega Man & Bass for an added dose of why am I doing this I must be insane. There is a possibility that I might be able to broadcast the event over a live video feed on Twitch.tv; if that happens, you'll be sure to hear about it here. Joining me will be two of my best friends, one of whom also happens to be my wife, so whether the livestream is successful or not, this promises to be a good time. - On the subject of Mega Man, I've been thinking more about Street Fighter X Mega Man, and it occurs to me that there might be a classic Mega Man-style plot twist in which Dr. Wily, much to everyone's astonishment, is actually the bad guy...and these aren't really Street Fighter characters, but robots made to look like them. In which case I am totally on board with this game. - On the subject of video games, I've been putting a lot of time into Mr. Robot, a Steam game that's a delightful mixture of The Adventures of Lolo, Portal, Metroid, Mega Man Battle Network, and Final Fantasy. 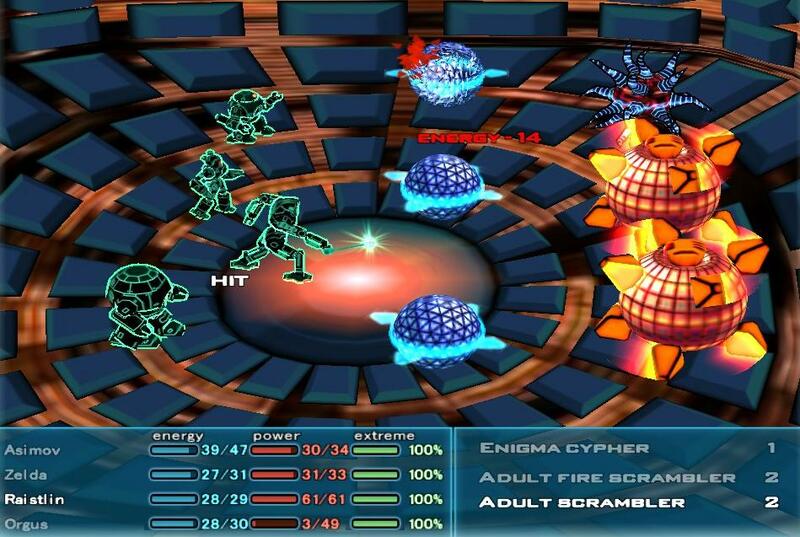 Unconventional, but it works incredibly well—push some blocks around, defeat a psychotic computer, search for secret passageways, and hack into the robotic enemies you can't dodge, fighting a series of virtual battles in cyberspace to destroy them from the inside. 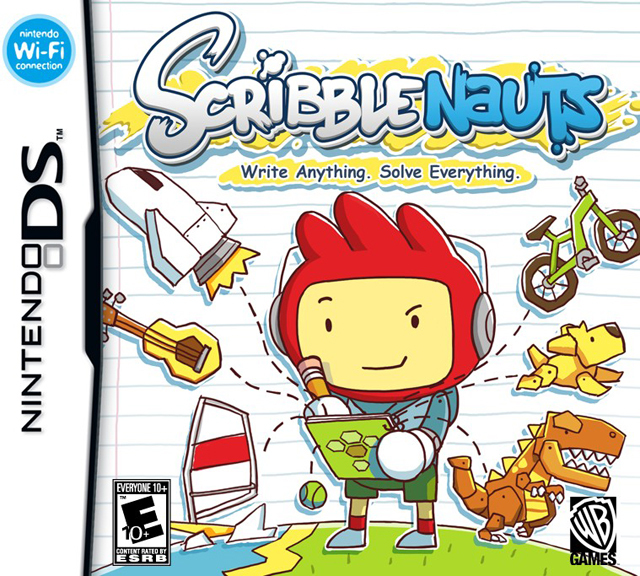 The RPG elements are somewhat repetitive and clunky, but that's the only real complaint I have about this little gem. I've also discovered "social gaming" while playing on Steam; that is to say, I actually...talk...to people while playing video games. Mr. Robot affords you plenty of chances to pause and ponder your next move, so it's been easy to pull up the text chat window when there's a lull in the action. - On the subject of "social gaming," I started playing Scribblenauts a few days ago, let my wife borrow it on a car trip, and since then we've been trading off the DS and regaling each other with stories of our hilarious successes and failures in this cartoony world where we solve puzzles by summoning almost anything our imaginations can conceive, which mostly involves dropping school buses on everything. Despite the game's outrageously unacceptable flaws (which this article by Nikola Suprak sums up rather entertainingly, albeit more harshly than I would), it's been a blast to let my creativity run wild and see what ridiculous things happen, for better or for worse, when I use a black hole to clean up the garbage littering a public park. Comparing notes with my wife, and having one of us occasionally watch over the other's shoulder, has been a great couple-building activity; I think there's something to be said about playing adventure and puzzle games as a team, too. - On the subject of couple-building activities, that trip to IKEA was only the beginning of our joint venture to transform our home into a home, identifying and addressing ways that we can take better ownership of our living space. This includes purchasing more shelving to accommodate our combined geek stuff, and unpacking the boxes that have been cluttering the guest bedroom's floor for over a year. I'm almost embarrassed about how excited we were to go pick out a new vacuum cleaner yesterday. - On the subject of putting things on a shelf, I've been mulling over what might happen if I were to start phasing myself off the Internet in 2013...or, perhaps better stated, if I were to take ownership of my presence on the Internet the way my wife and I have started taking ownership of our living space. I have this habit of being gung-ho about contributing something to the digital realm—be it a review, a video, or even a Facebook status update—and then discovering halfway through that it's taking far longer than it should to complete. And I am surprised by this every time. Every time. I need to learn to pick and choose my projects, and commit to a certain time frame for completion. "Sure, that sounds like fun" and "Whenever it's ready" are the two phrases that have continually sabotaged my ability to complete as many side projects as I'd like when I actually have the time to complete them. I'm also starting to weigh the pros and cons of keeping my Facebook account active—my expanding Internet presence has made me aware of privacy issues in ways I'd never needed to think about before, and Facebook is probably selling my credit card info to some wombat trainer in Uzbekistan as we speak. It seems to me that I've reached the same point as I was at the end of high school and the end of college—so overwhelmed by the things I've signed myself up for and have let myself get roped into that I need a break. A total purge. Give myself a chance to breathe again, and reexamine what I truly want to be doing with my free time. Which, more than likely, is everything I'm already doing. If you can step away from something, shake it up, tear it apart, and still want to come back to it, then you know it's worth coming back to. For now, it's business as usual. In the next few weeks I'll be aiming to finish off as many outstanding GameCola projects and YouTube videos as I can. Depending on how that goes, "purge everything" might not need to be one of my New Year's resolutions after all. Now, let's go back for a minute to 2010, to my reaction to Capcom's last official mainstream installment of the Mega Man series: "Because I'm a hopeless Mega Man fanatic, and because I wanted to write a truly comprehensive review of Mega Man 10, I made it a point to play the game into the ground—at this point, I hope it stays buried there a while." I left the game with the satisfaction of having blown stuff up real good, and with the disappointment of my favorite video game franchise heading off in a direction more appealing to hip, young gamers and people who hated everything after Mega Man 3. Part of me is looking forward to this new game, assuming it's not some sort of belated April Fools' gag—it appears that whoever's responsible knows what makes a Mega Man game fun, and loves Street Fighter enough to pull off a worthy crossover. The other part of me is saying, "Really? This is how we're celebrating Mega Man's 25th anniversary—with another Street Fighter game?" In other words, I don't really care. Or, at least, I've given up on caring. Capcom announced Mega Man Universe, then pulled the plug on it, and I really didn't mind. Same deal with Mega Man Legends 3—though, I have yet to play any of the Legends series, so perhaps I should have been enraged. Then there was Mega Man Xover, the sad-looking iOS game that no one in the fan community seemed to want to play. Now we've got yet another crossover. Yes, people love crossovers when they're done right. Yes, it looks like this one will be done right. No, I'm not enthusiastic about it. I'm tired of my favorite series being dragged in every direction but the one that actually matters to me. I don't want a level editor for Mega Man 2 that looks like a Flash game, or a messy mashup of multiple Mega Man series that looks like a Flash game, or a crossover of two completely unrelated series that looks like it was originally intended to be a Flash game. Those are all good fodder for a fangame or three, but it raises some questions about the future of the franchise when Mega Man 11 and its hypothetical brethren are ignored for over two years while these other games are touted as The Next Big Thing. 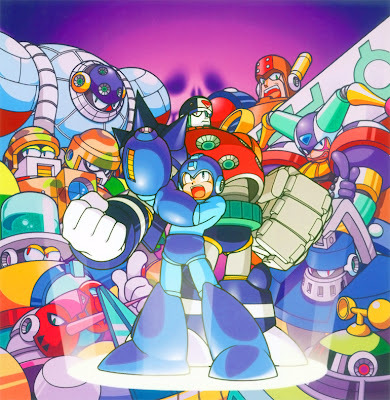 Crossovers, cameos, and out-of-continuity spinoffs are fun in moderation, but Zero's appearance in Tatsunoko vs. Capcom is no substitute for Mega Man X9. What's reassuring to me is the last line of the announcement article: "We know it's been a hard year for Mega Man fans, but I hope this proves our love and intent to the series, and that we have not heard the last of the little guy." In the wake of the physical and economic devastation Japan suffered last year, along with the departure of Keiji Inafune, it's understandable that Capcom has needed some time to regroup and figure out what, if anything, they should be doing with this franchise. I still wasn't entirely pleased with where things were headed before that, but I'm willing to accept that these past few years have been a time of transition. Perhaps this new game is just to hold us over until The Real Next Big Thing comes along later next year. All I ask for are upbeat music, plot and dialogue that at least make sense, new challenges, new weapons, AND THE CHARGE AND SLIDE BACK THANKYOUVERYMUCH. As long as I can get a new Mega Man game like that every couple of years—or if they finally bring one or more of the existing series to a satisfying conclusion—then I suppose I don't mind the occasional "fluff game," especially one that looks to be as promising as Street Fighter X Mega Man. Unless they keep making games for iOS, in which case I'll never be able to play them. Well, this came out today. Now, let's go back for a minute to 2009, to my reaction to the first movie in this new continuity: "The movie was amazing...but it wasn't Star Trek." I left the theater with the satisfaction of having seen stuff blow up real good IN SPAAAAAAAAACE, and with the disappointment of my favorite entertainment franchise heading off in a direction more appealing to hip, young Star Wars fans than curmudgeonly, fun-hating Star Trek fans like me. Part of me is looking forward to this new movie—crashing the Enterprise into downtown San Francisco looks like it should be cool, and I'll finally be able to determine whether this new direction was worth four years of aggravatingly conflicting emotions. The other part of me doesn't really care. You know I've still only seen the previous movie once? On opening day, in the theater. That's it. I've seen Star Trek: Nemesis at least four times—willingly, no less. I think that says something about where my loyalties lie. I'd rather watch bad Star Trek than a good movie pretending to be Star Trek. Though, really, I'm no longer sure the previous movie was all that good to begin with. And after more intense scrutiny, Nemesis doesn't seem as bad, either. I read through all of "Star Trek by the Minute," a series of 117 blog posts analyzing the science, moviecraft, and faithfulness to the Trek name of every single minute of the 2009 Star Trek film. I watched Cowboys & Aliens, a film written by the same guys who wrote Star Trek. I continued my ongoing endeavor to watch every episode of every official Star Trek series with several seasons of Next Generation, Deep Space Nine, and Voyager. I chatted about the film with Morgan Gendel, writer of (among others) TNG's famous episode "The Inner Light." I've had plenty of time to think about the 2009 film, and plenty of opportunities to pick it apart and compare it to other movies and other Trek. I've reached the conclusion that the action sequences, special effects, music, and novelty of having the original Star Trek back on the big screen have successfully masked some very serious flaws with the storytelling, and deflected attention off of the heart of the movie, which is so fundamentally different from what has traditionally made Star Trek...well, Star Trek. There have been bad films and bad episodes that haven't really felt like Star Trek, or haven't lived up to the standard of quality established by the likes of Wrath of Khan and "The Best of Both Worlds." Even with the wrong director at the helm or a sub-par script to work with, someone involved in any given Star Trek production was trying to keep Gene Roddenberry's vision of the future alive. If this new movie trailer is any indication, it looks to me like J.J. Abrams wants to recreate Star Trek in his own image. From the press release: "When the crew of the Enterprise is called back home, they find an unstoppable force of terror from within their own organization has detonated the fleet and everything it stands for, leaving our world in a state of crisis. With a personal score to settle, Captain Kirk leads a manhunt to a war-zone world to capture a one man weapon of mass destruction. As our heroes are propelled into an epic chess game of life and death, love will be challenged, friendships will be torn apart, and sacrifices must be made for the only family Kirk has left: his crew." So, let's think about that while we consider what was destroyed in the first film, and what will probably be destroyed in the second one: Spock's mother. Kirk's father. Vulcan. Starfleet. "Friendships," whatever those are. (I'm already blaming Uhura.) Possibly even the Enterprise itself. And that's not to mention the Prime timeline's Romulus, along with 40+ years of continuity. Kinda looks like he's gunning for a totally blank slate where the characters are the only things identifiable as being from Star Trek. Who's the villain in this one? Not an iconic alien like a Klingon or imported-from-another-timeline Romulan. Though, that is not to say the villain might not be iconic—that is, i-Khan-ic. What I'm hoping for: Those parasitic mind-control grubs from the TNG episode "Conspiracy" finally make their grand return, infiltrating Starfleet Command under the watchful eye of a lesser-known villain from the annals of Star Trek history. There can still be mind-control grubs, though. We'll see how this one turns out—without the oppressive shackles of loosely observed continuity shaping the direction of the story, J.J. Abrams and Co. are free to do absolutely anything they want with this film. Despite my cynicism, I'm open-minded enough to give Star Trek Into Darkness a chance. Skyfall was enough to rekindle my enthusiasm for the James Bond franchise after Casino Royale and Quantum of Solace took it in a direction I wasn't overly excited about; all it takes is one movie. 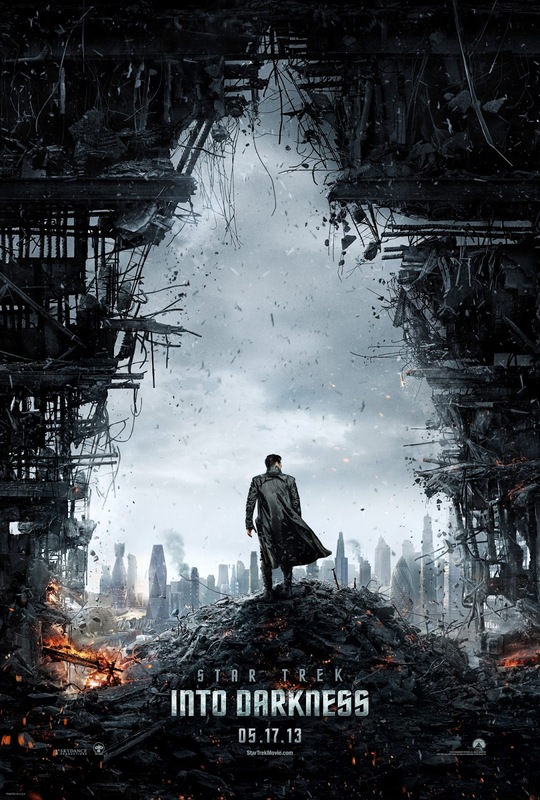 Though, given how downplayed the words "STAR TREK" are on the movie poster, I doubt Into Darkness will help me see the light. It is good to be back. Seriously taking stock of the situation here at the end of October was exactly what I needed to rekindle the enthusiasm. From my perspective, November was the strongest blogging month I've had since July or August, and it was also the most uniquely me this blog has seen in a while—more personal stories of one sort or another than usual, and no attempt to obfuscate the obvious fact that all I do in my spare time is watch movies, play video games, not record YouTube videos, and eat cheeseburgers.